Black and white First World War studies by Christopher Richard Wynne Nevinson (British, 1889-1946) will be on sale at the Grosvenor School & Avant-Garde British Printmaking auction at Bonhams, New Bond Street on 15 April 2014. 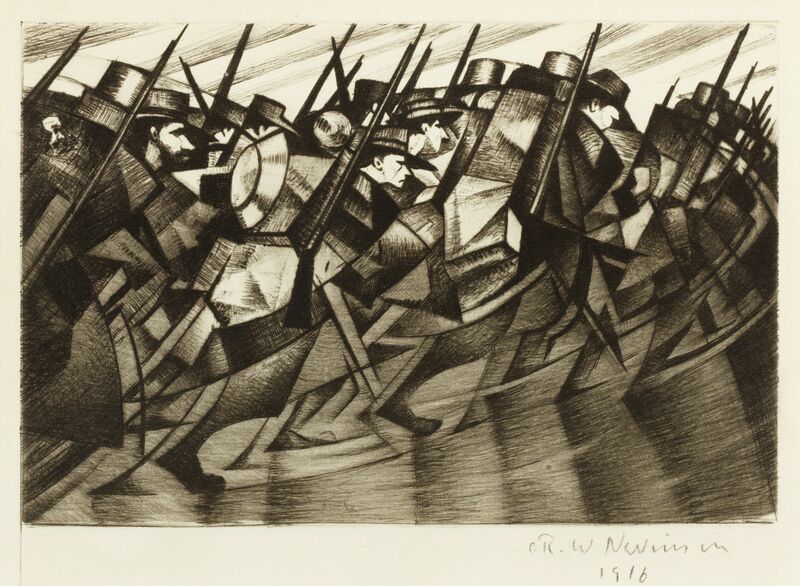 The top lot in the sale is Returning to the Trenches, a study of marching troops by Nevinson. Lines of striding limbs blur into grey, creating a rush of movement below. Motionless above, the soldiers’ angular faces and pointed bayonets are cut in sharp focus against a white sky. The print is signed and dated 1916 in pencil by the artist and is offered with estimates of £60,000-£80,000. 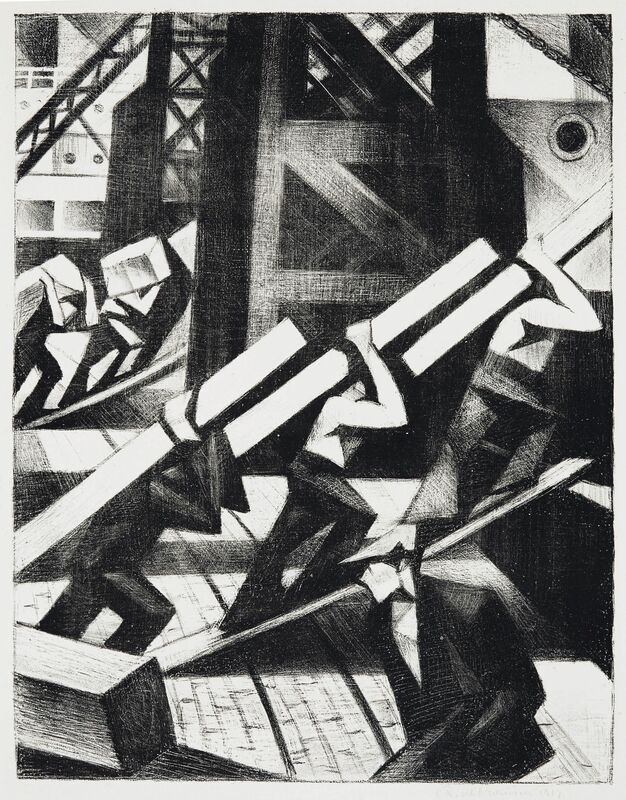 Other Nevinson wartime works include Loading the Ship, a 1917 lithograph showing soldiers loading cargo (estimated at £30,000-£50,000) and The Road from Arras to Bapaume of 1918 (estimated £30,000-50,000), showing a never-ending road stretching uphill into the grey distance. Nevinson was one of the most famous war artists of 1914-1918. At the outbreak of war in 1914 he joined the Friends Ambulance Unit tending to wounded French soldiers on the Western Front. On being sent back to Britain for health reasons he created a powerful series of Futurist paintings capturing the horrors and chaos of war. The Grosvenor School of Modern Art was founded in 1925 at 33 Warwick Square in Pimlico, London, by British artists and printmakers Claude Flight, Cyril Edward Power, Iain MacNab and Sybil Andrews, all of whom are represented in the 15 April sale. 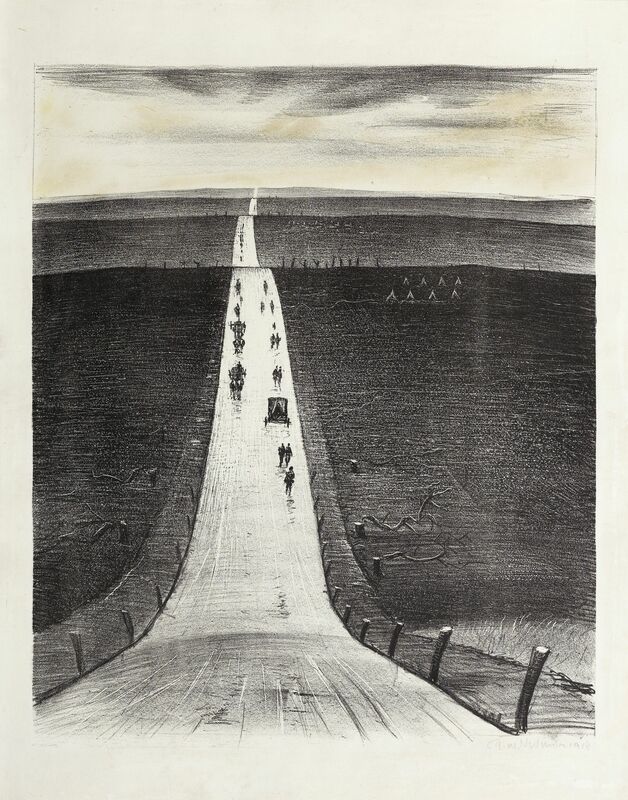 This entry was posted in News, World War I memoirs and tagged 1914, 1918, Bonhams, Centenary of the First World War, CRW Nevinson, First World War, news, UK News, war art, war artists. Bookmark the permalink. A touch of Duchamp at the top, cubism in the middle and the beautiful simplicity of a well known road at the bottom. Superb images.